In keeping with trying to bring to the forefront all of the available off roading groups around the state, I bring to you today Mid Rivers Jeep Thing Club located in St. Charles, Missouri. The Mid Rivers Jeep Thing Club was suggested to us by Eric Deverick. If you know of a group that we haven’t featured yet, please let us know and we will add it to our list. Please provide the URL with your suggestion. If the site does not have a current website, give us some background information on it and address and we will get it posted. 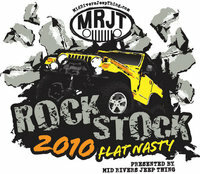 Here is some information about Mid Rivers Jeep Thing Club from their official website: www.midriversjeepthing.com. The website has information about the sponsors of Mid Rivers Jeep Thing Club. Once you enter, you will find a large and active forum where you can connect with others who share your love of off roading. The club is family-oriented and designed for all Jeep enthusiasts who are located in Eastern Missouri and seeks to provide social, educational, and recreational activities that will allow people to enjoy being off-road while at the same time protecting natural resources. To be a member, you must own a jeep of any make or model, use it to participate in club events, and attend at least one club event a year to be active. Memberships are based on a family unit and members have to have a valid driver’s license and be over 18. Those over the age of 18 are voting members, and all members must have no-fault and liability insurance. Dues are $25 for an entire year and are renewed on January 1. This gives a membership card, 2 club stickers, and access to all the activities and support. The group and forum are both well managed, and you can easily connect with other members, get information, find out about events, and find lots of friends. I know it has been a minute since I have featured a Jeeper here on our blog, but that doesn’t mean I have stopped. For some reason, those wanting to participate has slowed way down. So, if you know of someone you feel would make a great featured Jeeper, let me know! However, let’s get back to the meat of this blog – today’s Featured Jeeper Eric Deverick! Eric happens to be located close to my old stomping grounds so I can relate to the areas he plays in.  Without further ado… let me allow him to tell his story… Take it away Eric! My name is Eric Deverick. I am 34 yrs old, married with two girls. I live near St. Louis, MO but was born and raised near Chicago. I am still on my first Jeep and 88 YJ. It is still closer to stock than I would like, but time will change that. It has a 2″ lift running 31″ A/T’s. Smittybilt bumper on the rear and a Smittybilt Stinger going on the front soon. Under the hood I have an HEI Distributer and did a Motorcraft 2100 carb swap with Edlebrock air cleaner on top. Future mods will be SkullCrusher Fab tube fenders and homemade rocker guards. My favorite spot to off-road is Flat Nasty ORV in Jadwin, MO. I have also wheeled at Washita ORV, Sayersbrook Bison Ranch, and Hannibal Rocks. Favorite Off-road quote: Jeep for sale…when I’m dead and burried. I am a member of Mid River Jeep Thing. I am the Tech Inspector for this coming year, and due to the fact that I am rarely with out my camera on the trails, was dubbed Official Photographer for the club as well. I have only been off-roading for a couple of years now. But I am hooked for life, and plan on many years of fun to come. Last week I asked the fans on the XtremeTerrain Facebook fanpage if they had any particular Jeep off roading club they belonged to that they would like to give a shout out to, and there was a great response. As I am wrapping up the list of clubs provided, the next to be given a great shout to is the MidRivers Jeep Thing. The MidRivers Jeep thing was brought to my attention by Eric, a.k.a. Bull Shark. Eric helped me tremendously and compiled this great information for you all! Thanks again Eric! Eric tells us that the MidRivers Jeep Thing is a local club centered around St. Charles Mo near St. Louis. Here is more information Eric shared with me for all of you Jeep Enthusiasts. Our club is open to anyone who owns any type of Jeep. This includes stock to heavily modified. We offer activities for families as well as the hard-core off-road Jeep enthusiast. Our club activities are determined by the membership. Meetings are held on the second Tuesday of every month, check www.midriversjeepthing.com for meeting location and upcoming events. We are a rapidly growing club and will only get better with your participation, ideas, and suggestions. We look forward to meeting you at the next meeting. Annual memberships run January 1st through December 31st. Dues are $35, which goes toward the Club picnic and prizes at the Christmas Party. As well as group excursions to parks further away for special events. Rock Stock 2010 presented by Mid Rivers Jeep Thing is also going on this Memorial Day Weekend. Her is some more information on that event! This is a Scavenger Hunt throughout the park. Forms due back to the food tent by noon Sunday. Prizes will be awarded through a drawing of forms that have been completed correctly. You will need a digital camera with a display to participate. Pictures will need to be shown along with your entry form. Hook your rig to another and pull the biggest and baddest wins! The raffle drawing will take place at the office. You must be present to win. Each class will run Trail #3 for a “time”, Stock and Intermediate run only the trail, the Big Boys must run through the “Bone Yard” pits before finishing. You must have/wear a helmet for this portion as well as seatbelts. Each class will run the second half of Trail 4; this is the start of the “Rockcrawling” portion and is not timed but will have a time limit. Courses will be set up for each class with cones, hit a cone, reverse or winch receive points, each point is a 10 second penalty added to your timed run score. Lowest time in each class wins, the tiebreaker is fastest time completing the “Rockcrawl” portion. Standard Rockcrawling rules will apply for the accumulation of points. You may choose to have a spotter but is not required. You must have/wear a helmet for this portion as well as seatbelts. Check out www.midriversjeepthing.com for more details.